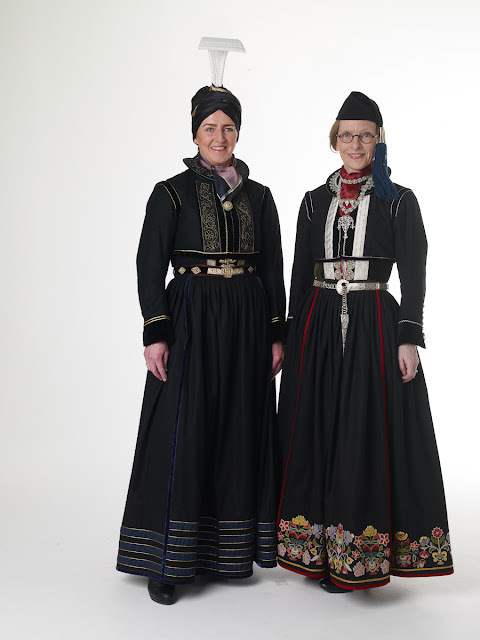 Today I would like to start a series on the folk or national costumes of Iceland, in the local language Ísland. 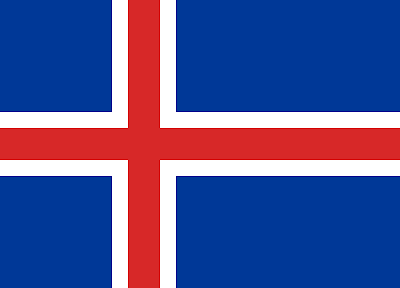 Iceland was first settled by the Norse in 874, the first known settler being Ingólfur Arnarson, although it is known that Gaelic monks had lived there earlier. The settlers were mostly from what is now Norway, with some admixture of Irish and Scots. The Icelandic language is little changed since that time, being the closest of all Scandinavian languages to that of the Vikings. 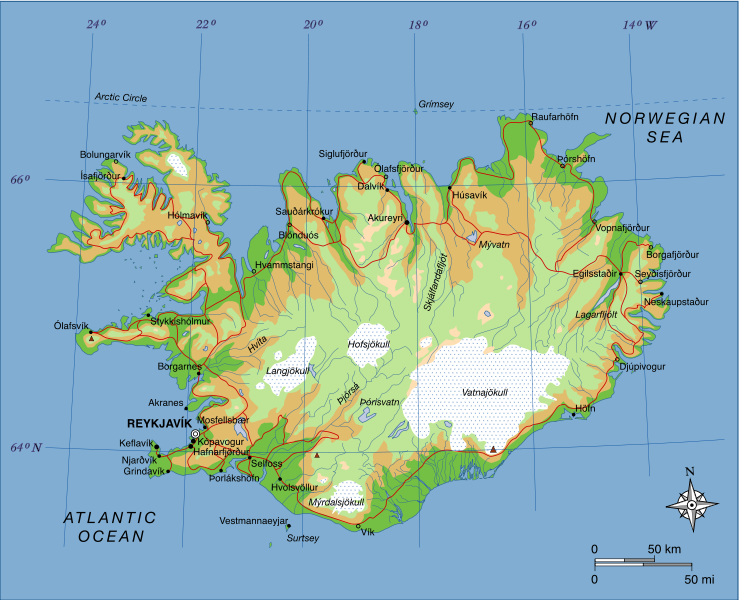 Iceland is a large island northwest of the British Isles. It is a favorite site for geneological research, because there are not a large number of people, and the ancestry of every person has been meticulously documented since their arrival. There are no traditional regions, the population being mostly on the coasts. The capitol is Reykjavík, and this is their flag. 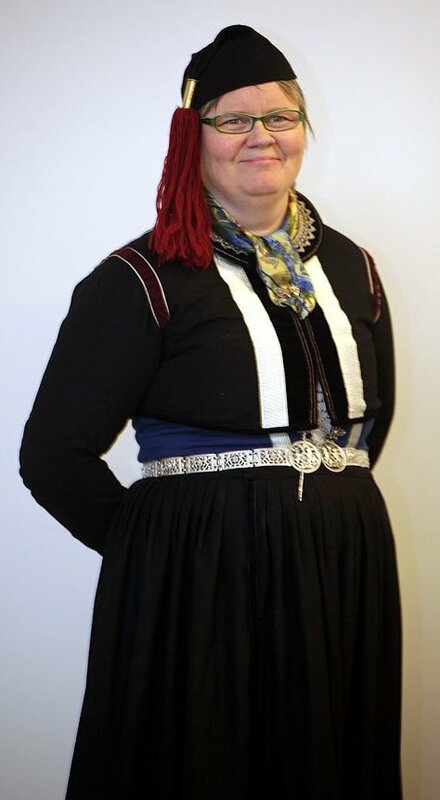 Íslenski Þjóðbúningurinn is the name for the national or folk costumes of Iceland, you will notice that buningur is from the same root as the Norwegian bunad. To help you pronounce this, the first letter is called 'thorn', and is pronounced like th in thin, the fourth letter is pronounced like th in this. Old English had these letters and then gave them up, a bad idea in my opinion, since English still has these sounds. There are five types of buningur for women, which are not regional, but all of which belong to the entire nation. Rather they come from different periods and had differing uses. For men there are only two types, an older form and a more modern, formal form. 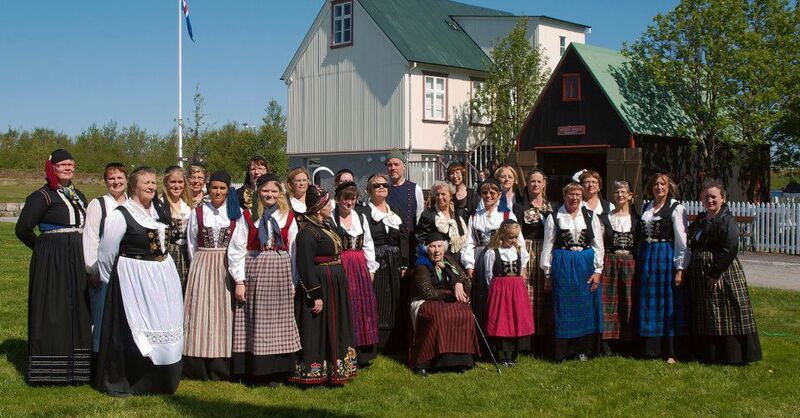 Faldbúningur is the oldest form, and had gone out of use by around 1850, but has been to some extent revived today. It was also the starting point for most of the other forms. It is characterized by a large white headpiece that curves forward. 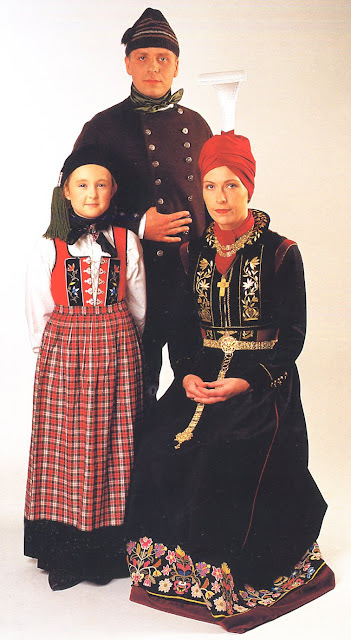 This was called the krókfaldur. 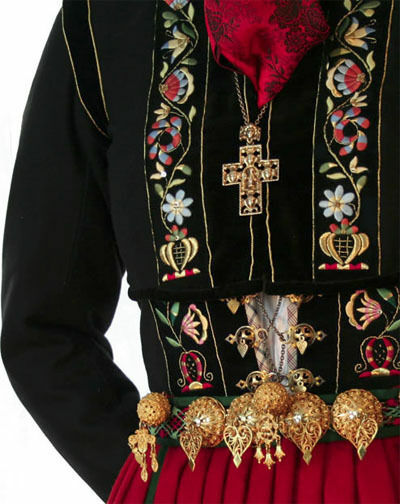 The form shown above was typical in the 18th cent. 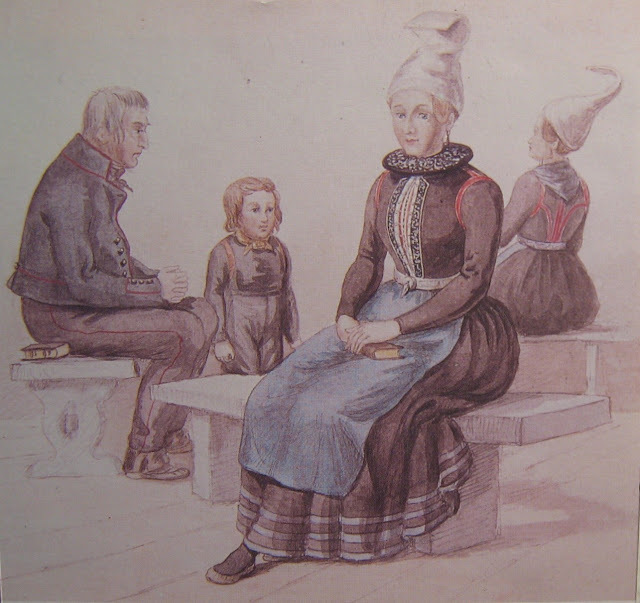 In the 19th century the headdress had become flat. 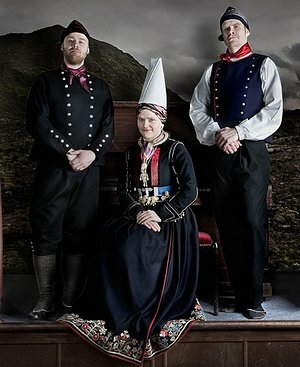 This variant was called the spaðafaldur. 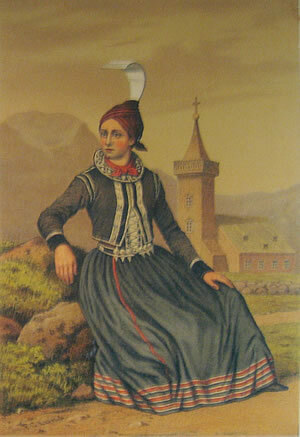 Linen does not grow in Iceland, so it is not known what was used for the chemise, possibly a thin white wool was used. 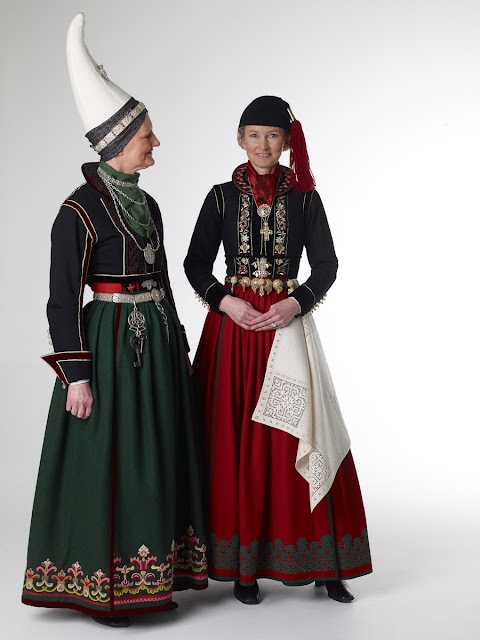 A full skirt with matching apron was worn, sometimes ornamented with ribbons, as seen here above. 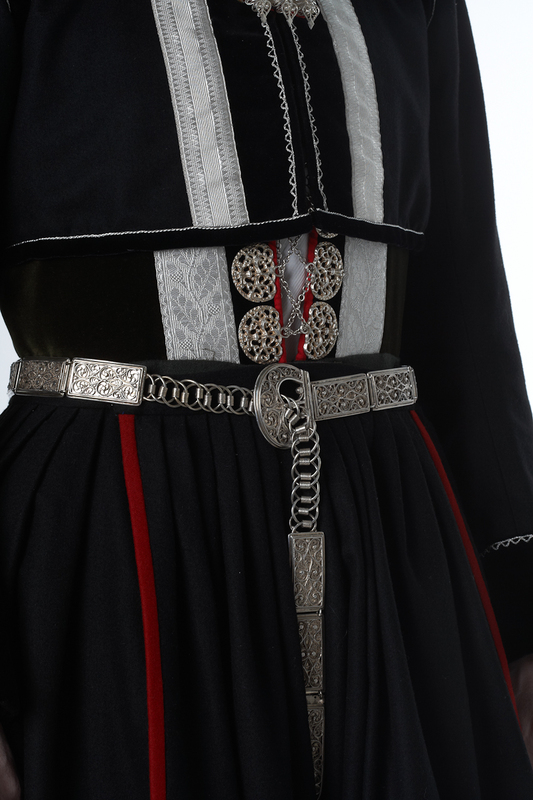 Sometimes the hem of each was covered with split-stitch embroidery. 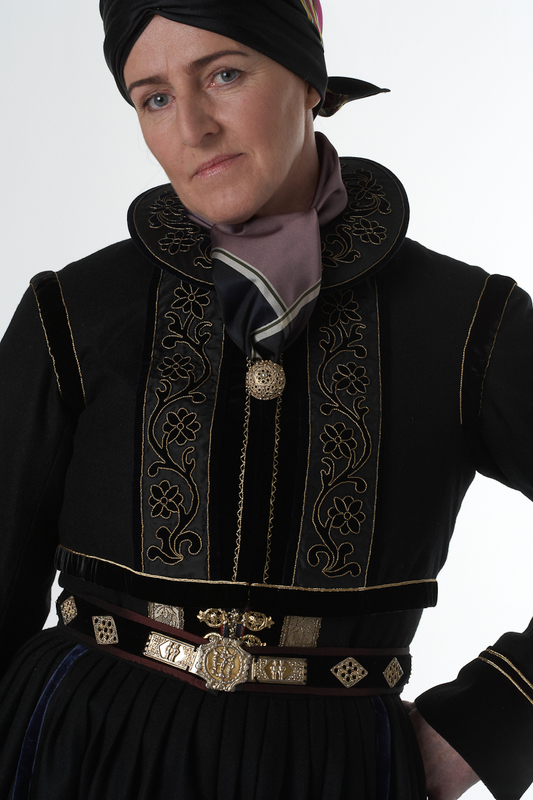 A bodice was worn, and a jacket over that, each of which was often ornamented with ribbon or embroidery. 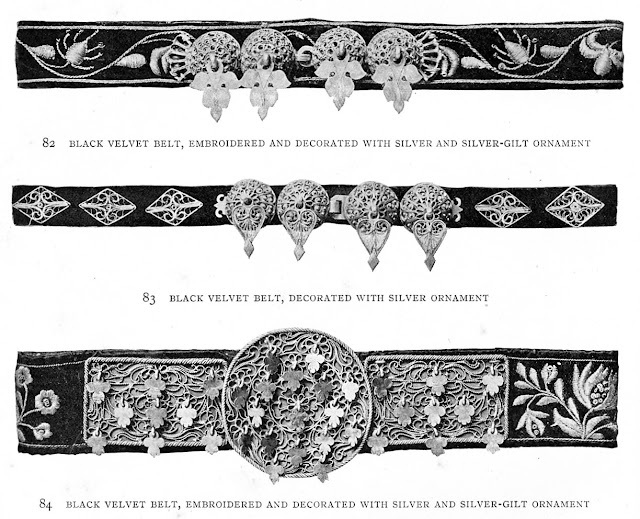 Gold embroidery was often used. 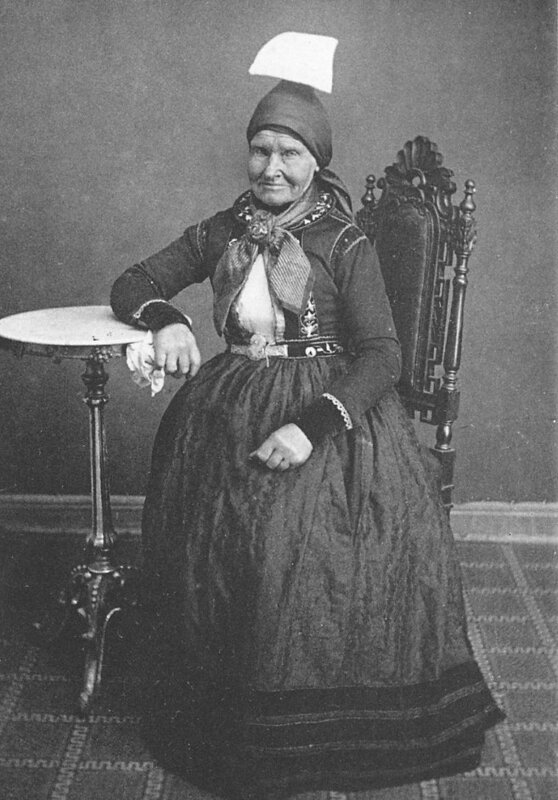 The bodice was laced with silver chain. 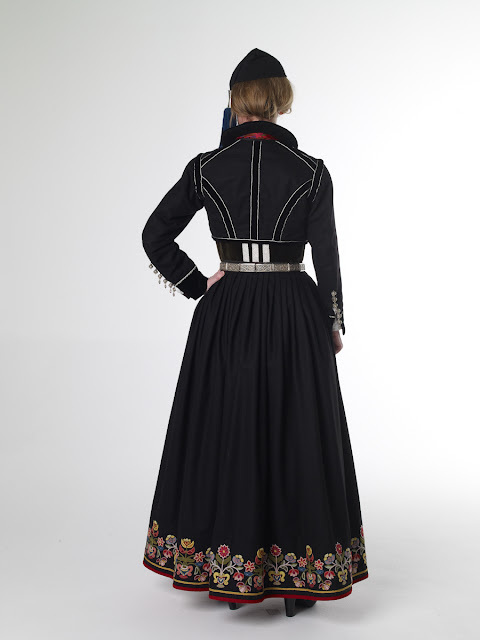 In some periods the jacket was shorter than the bodice, but at other times they were about the same length. 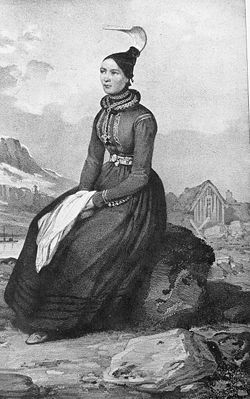 If the skirt and apron were embroidered, a matching 'loose pocket' was often worn with them. 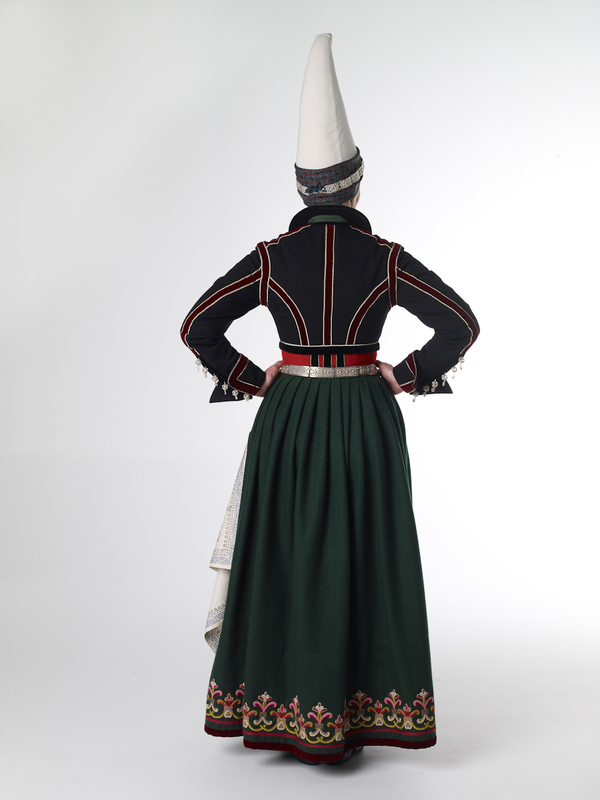 In the mid to latter 18th cent, the high headdress began to be replaced by a stocking cap with a large tube and tassel, which was adapted from the men's costume. Rich jewelry was worn, including intricate metal belts. A silk kerchief was often tied around the neck. Soft slippers or silver buckled shoes were also worn by those who could get them. 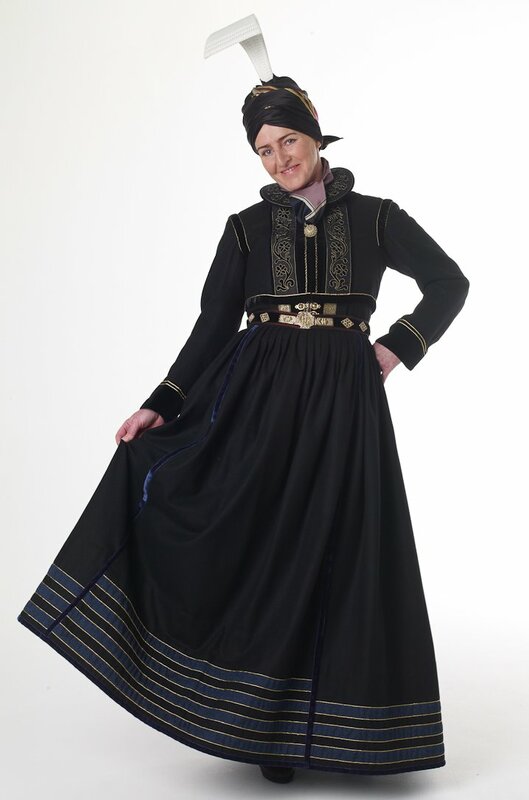 I will close with a few more examples of this costume. I will cover the other variants in future postings.